Ah, pants. Two tubes of fabric and yet how you puzzle us all! 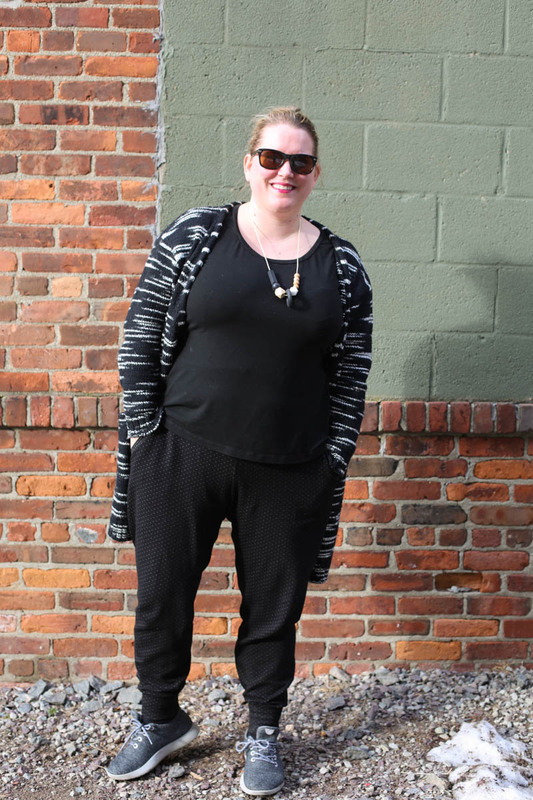 Today I’m sharing my latest make: the True Bias Hudson Pants. It’s a curious story, because the Hudsons were, I believe, the first pants I ever made, and with a great result! I blogged about them, and have worn them regularly every since – so comfortable and yet stylish in a athleisure-trendy kinda way. So, when I found some AMAZING ponte on Emma One Sock (my #1 source of knits, by far), and decided I’d have to make a new pair. I suspect it’s not quite as apparent in these photos as in real life, but the fit is WAY different. I double checked that I did the legs the right way around, but for some reason I have mega odd pulling and pooling in the crotch area, and the back is no better – check out that weird combo of bagginess and pulling! Now, for a confession. Despite the fact these fit me so poorly I’m still wearing them regularly. Yep! Because the reality is: most of us don’t wear perfectly fitting clothes all of the time, non-sewists never seem to notice fit *at all*, and, they are extremely comfortable. And sometimes comfort wins out! I have to say that seeing these photos now does give me pause… but I’ll probably still wear them. Does anyone have any bright ideas about what went wrong here or what I should change? I made the same size as before – the only thing I didn’t do this time was narrow the legs.. which I could try, though I’m skeptical it would solve the problem. Size Range: 2, because it only goes up to an 18 – albeit a very generous 18. Instructions: 5. Great! Easy for a beginner. Final Fit: 3? Mebbe? 2? Overall Rating: For this pair, 3.5, but for my old ones 4.5. So, any bright ideas for me dear CSC readers? If I could get the old fit, I’d be pleased as punch with these! To me,hey look too big on you. I think you should try narrowing the leg. Maybe next time keep this size at the waist and grade down for the hips and legs. I’m no pants fitting expert, but I often have the same issues with pants. It looks like you might need a combo of a full-thigh adjustment and a slightly lower crotch curve. You could try carving out a bit from the just the curved part of the crotch seam-start small though-like 1/4″ since it’s not really reversible, if it doesn’t work out. This might help with the bagginess if the front, too. The only way I can think of to implement a full inner thigh adjustment on a finished pair of pants is to add a gusset to the inseam/crotch area-which would be totally worth trying, since they’re easy to do, and with some careful ripping out, can be removed if it doesn’t solve the problem. Good Luck! I’ve made 4 pairs of hudsons, all in ponte. Every pair I’ve had to take about a inch from the CF and blend into the crotch curve. I thought it might be my pear shape, but maybe it’s the pattern. Today’s Fit 1331 (Vogue) is my go-to palazzo pants pattern. I always use a knit that is recommended on the pattern envelope. Unless I use the exact same type of fabric, they all turn out fitting differently. And when I say the exact same fabric, I’m saying different Pontes even fit differently. To get an identical fit, I need to use a Ponte from the same fabric collection. I think this second pair might fit differently because of the fabric. I think the main issue is the fabric. I see two things going on here. I think the first outfit is a little snazzier — doesn’t even look like exercise wear. The second one is a lot more informal. Plus, my guess is the second pair of pants don’t look as bad as you think. I think they look really good from the front. On the back view picture, you have your hands in your pockets, and I think that’s distorting the fit of the pants somewhat. I betcha’ if you had someone videotape you walking the fit would look different. Then there’s perspective. If you look at these pants as official pants, you might could argue there are some flaws. But if you judge them against traditional sweats or yoga pants, they rank pretty much up there. 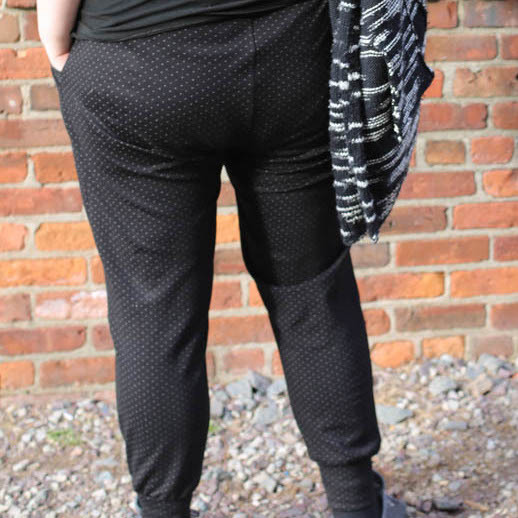 Jenny, I made the same mistake recently, making my self drafted incredibly comfortable and well fitted leggings out of ponte, when previously I used 4-way-stretch material with perfect results. Its that one-directional stretch of Ponte thats at fault is my guess. I had to add four inches onto the rise to make mine comfy. You might need to do an adjustment for a fuller thigh. The legs look like they are twising, as well. Are the legs pulling when you wear them? I went back to look at your previous post. I think the clue here is your comment in the previous post: “I used this absolutely amazing 4-way stretch rayon blend ponte from EmmaOneSock.” I don’t think the ponte is a 4-way stretch fabric. That also could be part of the problem. Looking back at the True Bias website, this pant fits a lot closer to the body, while yours look more baggy. I think both pairs are cute! Do you think the problem is with the fabric? Maybe the grain line isnt straight. I bought fabric that came off the bolt that way once…the grainline was a slow twisted spural. Jenny, I am just finishing a pair of wide leg, ealstiv waist trousers. I carefully measured my hip circumference and chose a pattern based on this size. I made a toile out of poly cotton forst. When I first tried them they seemed too tight in circumference (I thought…I almost let out the sides) – but I checked for fitting advice on Pintrest. The pull lines I had match a too short crotch. Something I have never done is measure my crotch length. I measured my crotch length from fron to back, and found my measurement was 3 inches longer than the pattern crotch. I slashed and lengthened the pattern crotch…and the difference was unbelievable. The trousers were now loose around my hips! That was the only adjustment needed. All my life when I tried making trousers in the past, I was simply adding to the hips, which NEVER looked right, and was why I gave up on trying trousers. This crotch measurement is the most important thing I have discovered regards sewing trousers. It looks as though your pant legs got twisted, hence the pulling and bagginess. It could also be your fabric. I have spent January and February making pants for an upcoming trip and have found when I use different fabrics, same pattern, a twist appears. Sometimes it occurs in the sewing process, sometimes it happens when pressing. Too much steam, fabric composition, stretching, shrinking or twisting happens. I can’t seem to find a solution, but like you, wear them anyway! I hope this helps. Heather at Closet Case Files has written about these types of fitting issues. I have read her e book as part of her super new Dream Jeans online line course and although these are a different style the issues would seem to be generic to trousers (as we like to call them here in your old country!) She has previously covered fitting jeans on her blog. I do like this style and would be interested to know if the issue arose due to making them up in a different type of fabric?